ESVAGT’s market leading SOV service concept is the main attraction at N-J40; ESVAGT’s exhibition stand at Offshore Wind Energy 2017. “We are looking forward to presenting the concept at OWE2017 and showing customers and partners a cost efficient, safe and smooth operation of far shore wind farms”, he says. We support the offshore Oil & Gas industries with a wide range of specialized services: Standby, Emergency Response and Resque Vessels (ERRV), Oil spill response, Firefighting, Tanker assists, Rig moves, Supply services and Interfield transfer of cargo and personnel. In 2010, ESVAGT brought the dedicated offshore wind Service Operation Vessels (SOV) to the market. The SOVs provide accommodation for technicians, spare time facilities, offices and conference room, storage for small turbine parts, workshops, etc. The SOV offers flexible personnel and equipment transfer capabilities by either Walk-to-Work gangway system or Safe Transfer Boats. 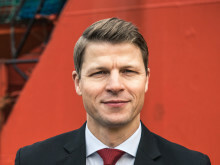 ESVAGT was founded in 1981 and has a fleet of more than 40 vessels and approximately 900 employees on- and offshore. ESVAGT has launched a short video featuring ESVAGT’s unique Service Operation Vessel (SOV) – a proven concept for cost efficient operation and maintenance of offshore wind farms. 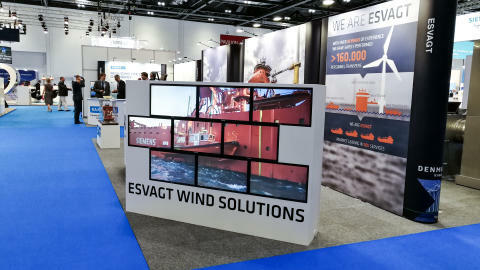 ESVAGT’s exhibition stand for the Offshore Wind Energy exhibition in London was an exam piece for three multimedia students from south-west Denmark’s business academy, Erhvervsakademi Sydvest.